SW020. 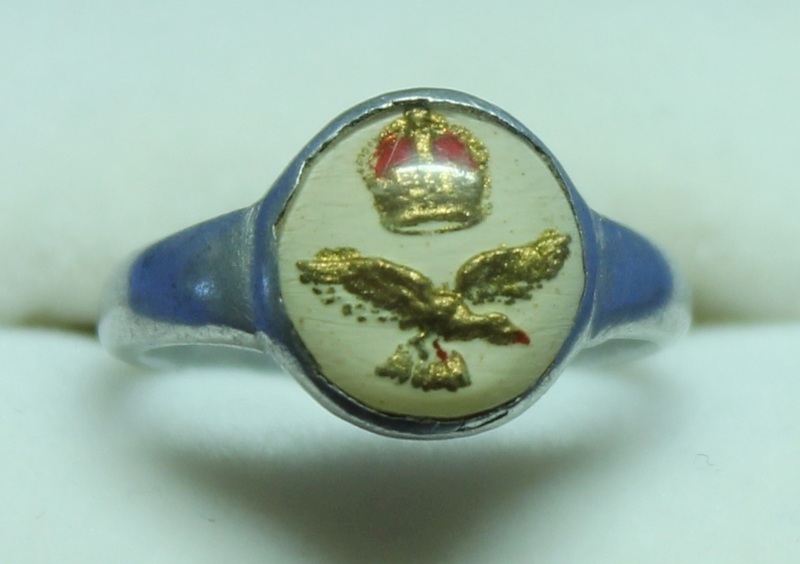 A trench art ring made from aluminium with a white Perspex insert, an eagle and crown is painted in red and gold on a white background. SW047. 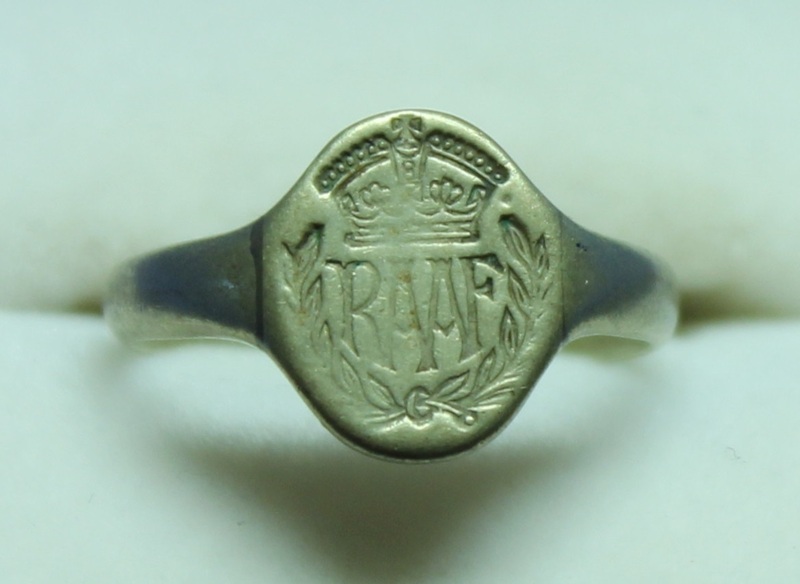 A trench art aluminium ladies ring with RAAF engraved on the front. SW048. 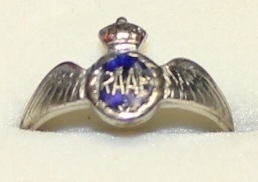 A silver ladies ring with a pilot’s badge design in blue enamel, there are no markings inside. SW055. 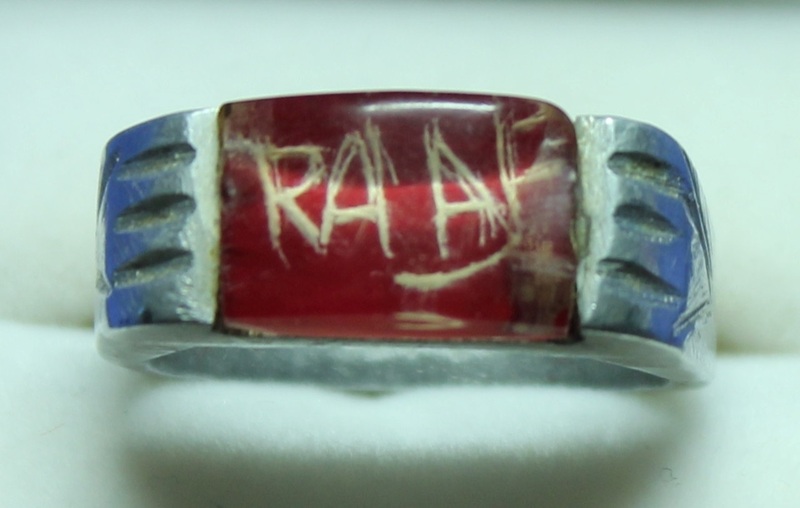 A trench art ring made from aluminium with a Perspex insert, RAAF is etched into the red background. SW126. 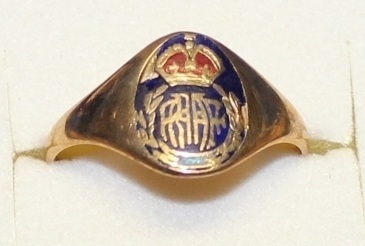 A gold ladies ring with an airman’s badge in blue and red, the ring is stamped 9CT. SW126. Marking inside of ring. SW156. 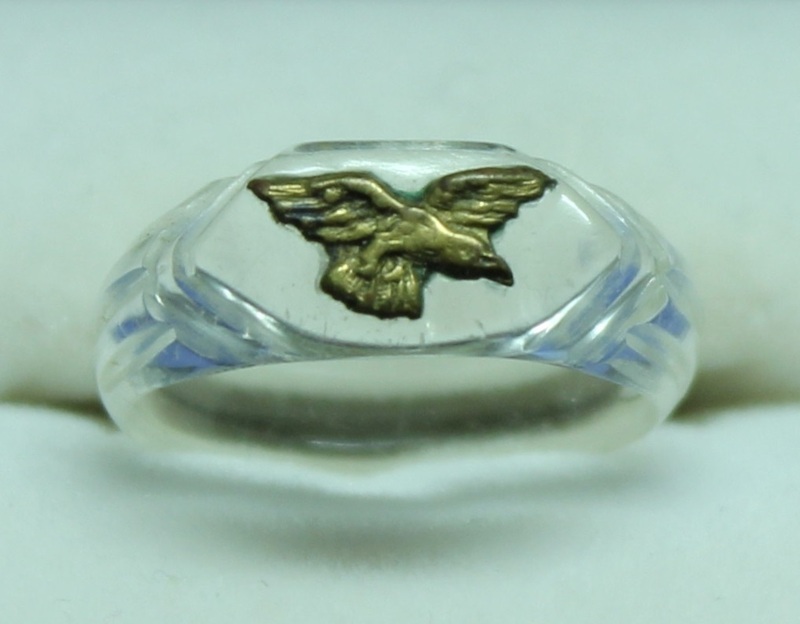 A trench art ladies ring made from clear Perspex inset with a brass eagle from a RAAF button. SW157. 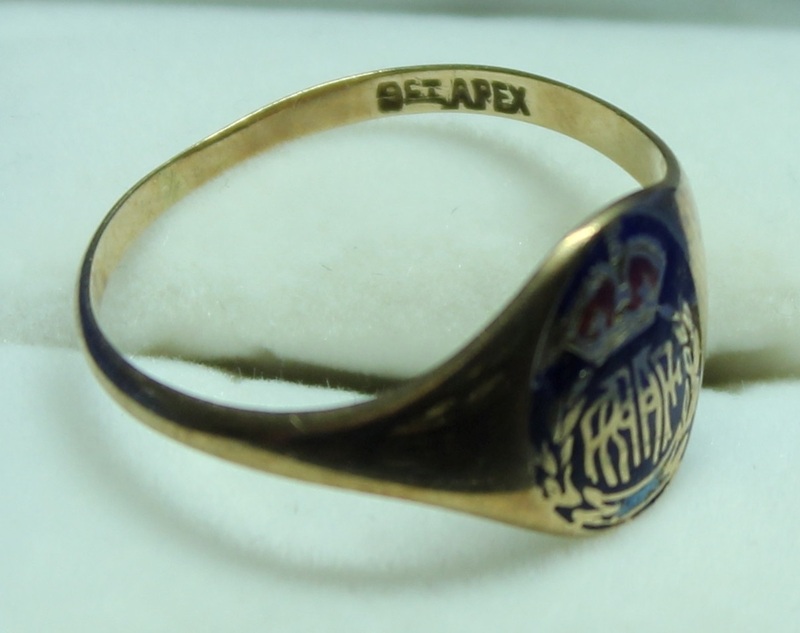 A gold man’s ring with an airman’s badge in blue and red, the ring is stamped 9CT APEX. SW157. Marking inside of ring. SW182. 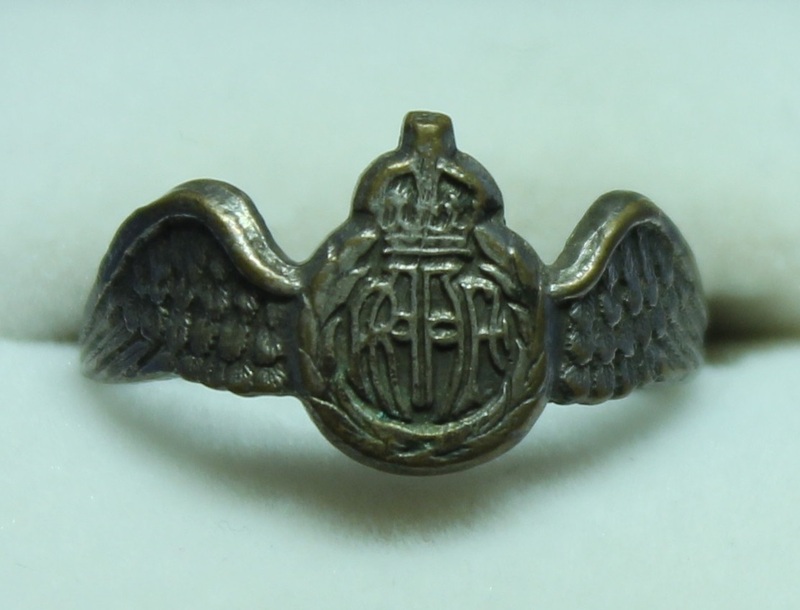 A silver ladies ring with a RAAF pilot’s badge design, there are no markings inside. SW185. 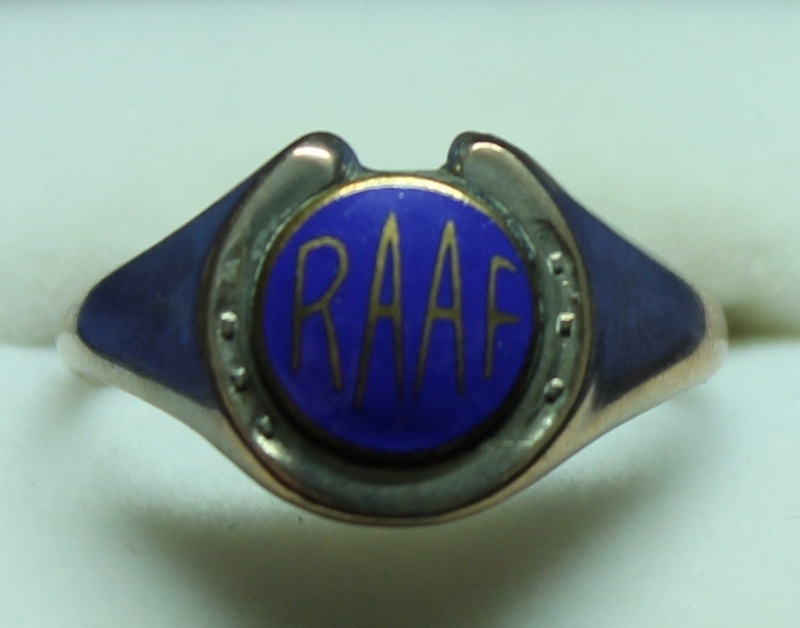 A gold man’s ring with a gold horseshoe surrounding RAAF in gold on mid blue. 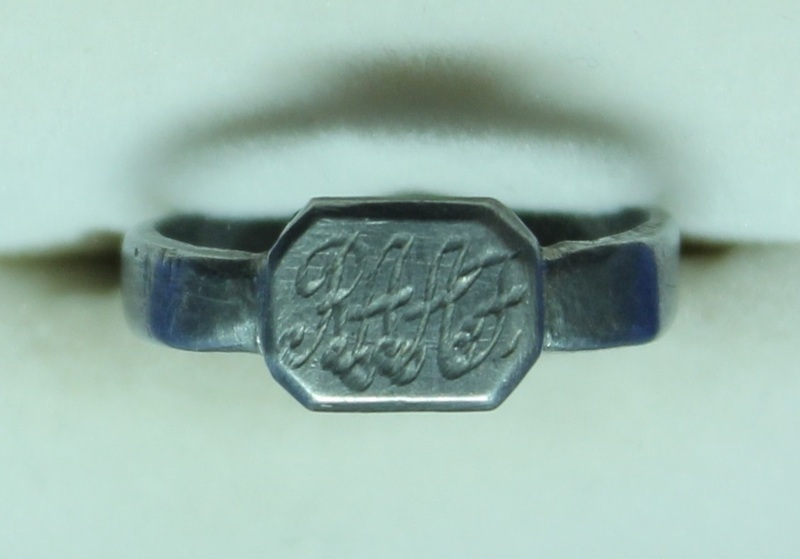 The ring is stamped 9CT SL. SW185. 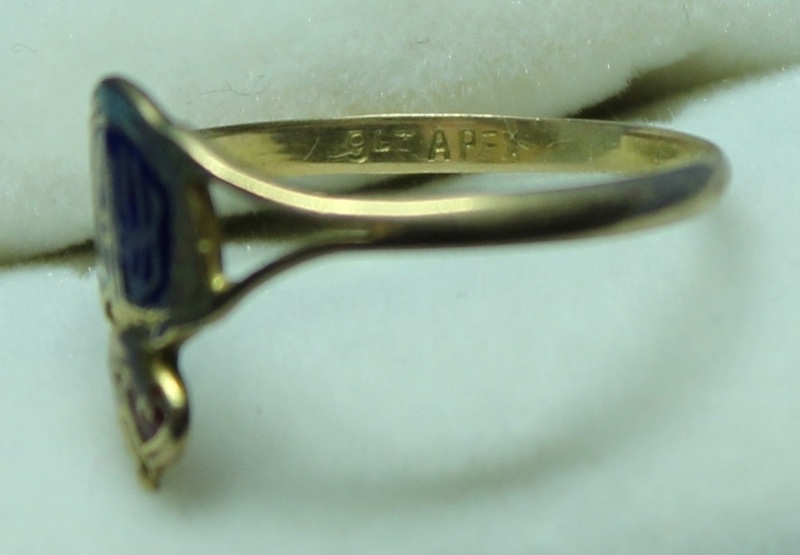 Marking inside of ring. SW187. 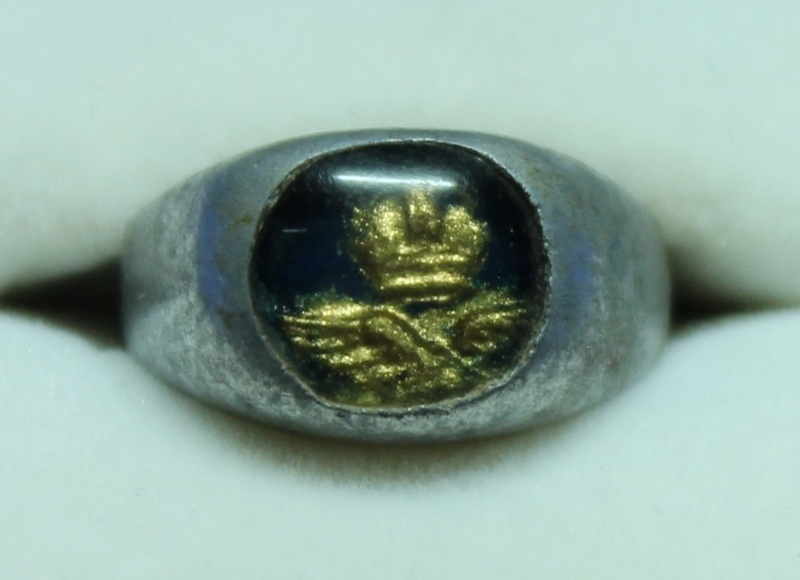 A trench art aluminium ladies ring with a gold eagle and crown on a black background. SW194. 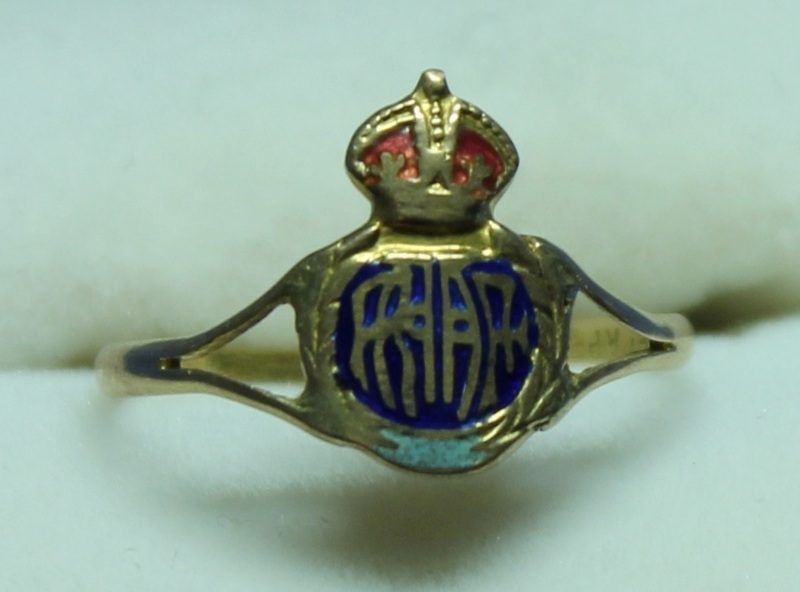 A gold ladies ring with an airman’s badge in 2 shades of blue and red. 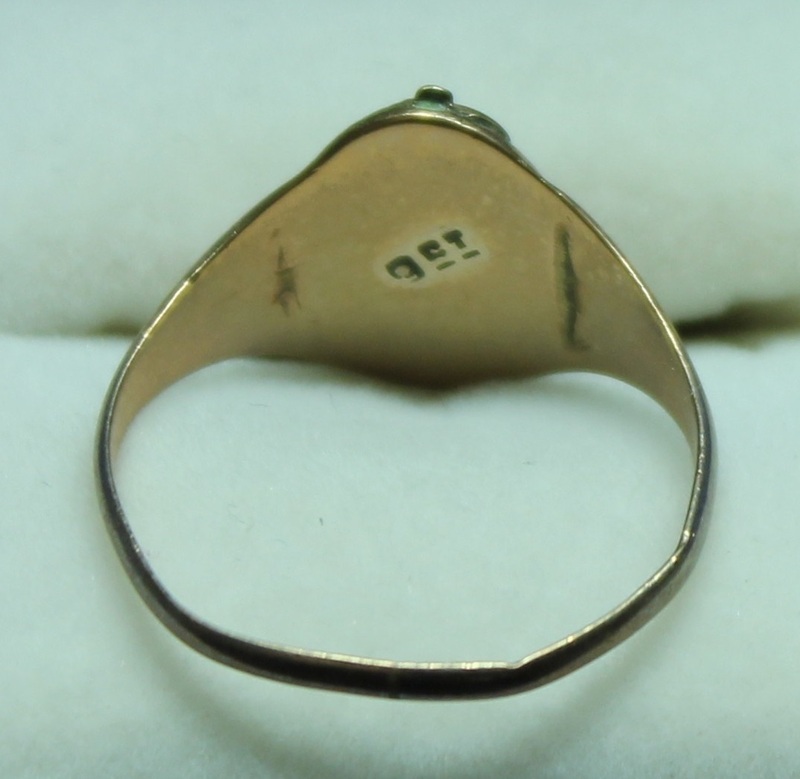 The ring is stamped 9CT APEX. SW194. 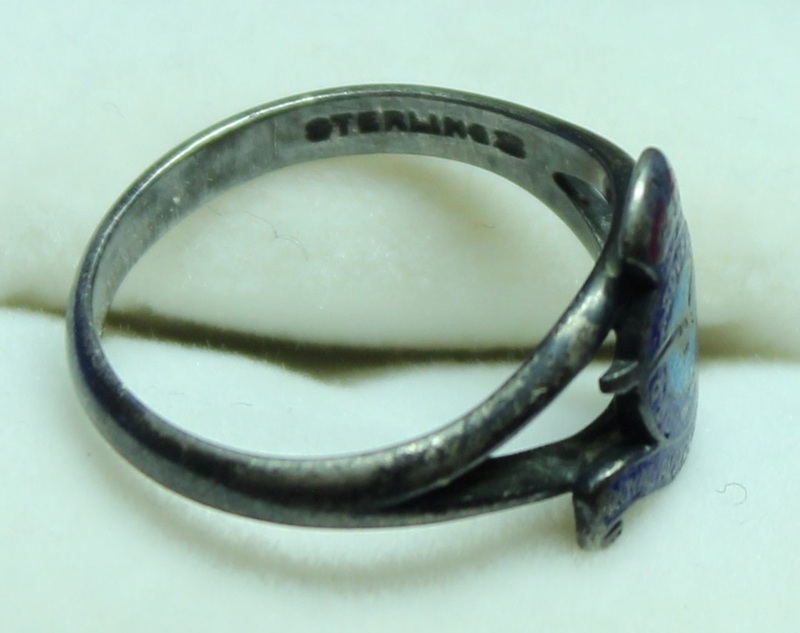 Marking inside of ring. SW205. 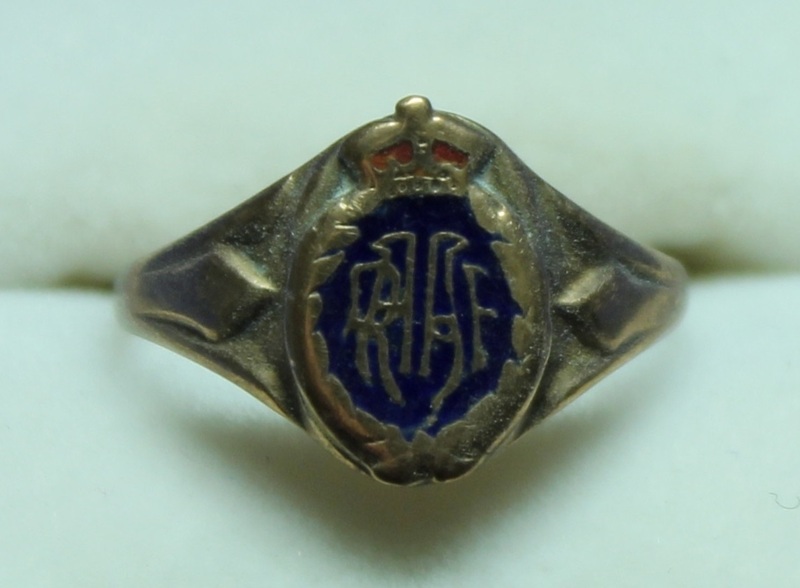 A silver ring with a stylised crown over RAAF within a laurel. No makers mark can be found. SW206. 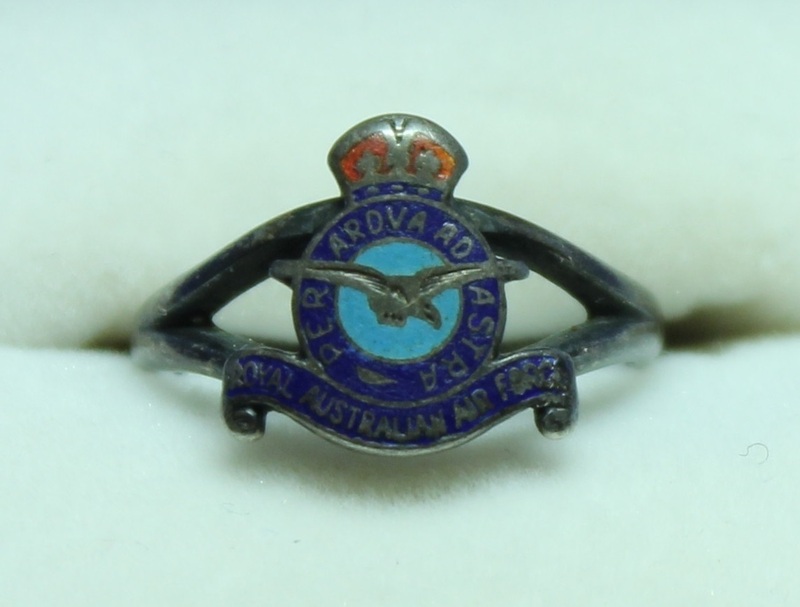 A silver ladies’ ring with the RAAF badge in 2 shades of blue and red. 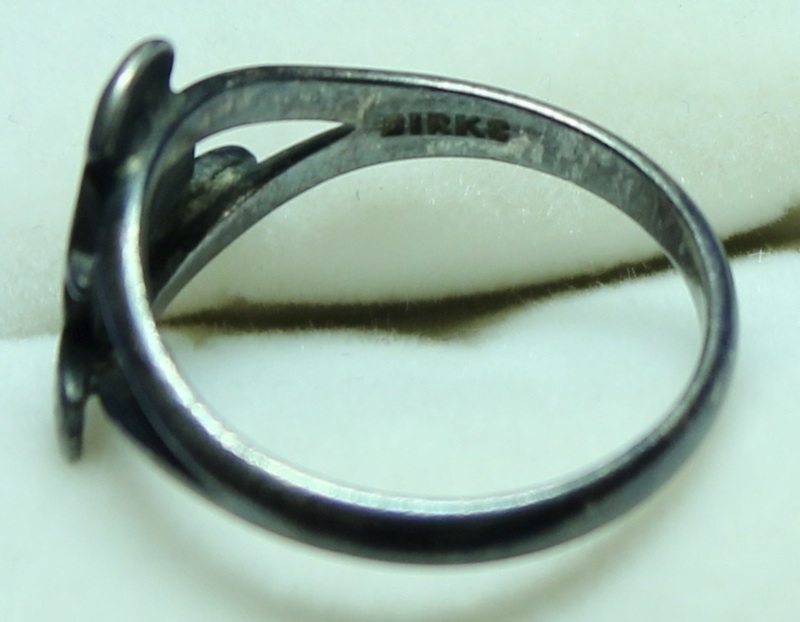 The ring is stamped BIRKS STERLING.